Looking "where to sell my Alfa Romeo Sprint Zagato?" Ask the Chicago Car Club! Are you wondering "where to sell my Alfa Romeo Sprint Zagato ?" The Chicago Car Club is interested in classic cars of all makes and models, especially a Alfa Romeo Sprint Zagato. We make the process of selling your Alfa Romeo Sprint Zagato quick and painless. In just a matter of hours we will have your classic valued and, if you do so choose, turned into money in your pocket. All it takes is a phone call or electronic inquiry to get the ball rolling. The Sprint Zagato, or ES-30 (Experimental Sportscar 3.0 litre,) was a concept car built between 1989 and 1991, by Italian car maker Alfa Romeo, in partnership with Zagato and Fiat. 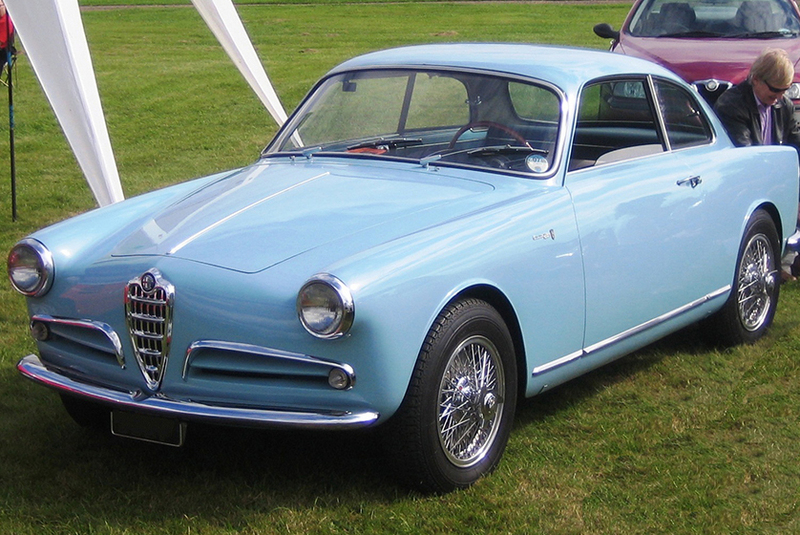 It was named after the Alfa Romeo Giulietta SZ built back in 1956. The 50’s car was built by the Zagato coach builder from a crashed Sprint Veloce body. It was so successful in competition that they build 18 more and then put them into full production. 217 were built on the original design and 46 more were built with a kamm-style rear end and front disk brakes. The original round tail versions were called “Conda Tonda” and the kamm-design were called “Conda Tronca,” for truncated tail. These SZ cars helped Alfa Romeo to victory in many national and international races, including the 1962 and 1963 FIA Sportscar Championships. In 1989 the car was re-imagined and built with modern technology. It was debuted a the 1989 Geneva Motor Show, and called the ES-30 prototype by Zagato. The engine was 3.0 V6 12V (2959 cc), 210 PS (154 kW) at 6200 rpm,245 N·m (181 lb·ft) at 4500 rpm. The suspension was a modified version of the Alfa 75 group A/IMSA car. It was re-engineered by the team managers and engineer, Giorgio Pianta, from Lancia and Fiat. It was capable of cornering at 1.4G. A two seater version was produced for several years in the mid-90s, called the Roadster Zagato. 350 cars were planned for the production run, but only 252 were built, because Alfa Romeo went into bankruptcy. Another 32 cars were built while the company was in receivership, bringing the total built to 284. A total of 1036 SZ models were produced. The only color scheme available on SZ production models was red, with a grey roof and tan interior. The RZ came in three schemes: Red with Black leather, Black with Red leather interior and Yellow with Black leather interior. Three special versions were made in silver and one in pearl white.